The numbers are going in the right direction again! I’ve lost 4 of the 5 pounds I’d gained last week which is really good. Just one more to go and I should be able to do that over the next seven days thus sticking to my plan of getting back to where I started over the course of a fortnight. I’m not really very happy though. I’ve lost those 4lbs more by good luck than good management as I’ve not been sticking to my plan. A treat today (it’s hot – I need ice cream) has morphed into a treat everyday (it’s Tuesday – I need ice cream). And, meantime, I’ve had a couple of social occasions which have revolved around food and alcohol (as these things tend to do). I know from (bitter) experience that, when things start to slip this way, it’s a short step back into bingeous-extremis. I need to stop the rot now, before I’m back in a size 26 and the Land of Back-Ache. Actually, I have had a bit of back-ache over the past week and that little reminder is more than enough. I really feel a lack of confidence in my ability to stick to the eating plan I’ve designed. Probably because I’ve been ‘proving’ to myself that I can’t. Or, rather, won’t. I’ve been here before and, really, it’s never had a happy ending. However, I’ve thought a lot about my past experiences and have come to the conclusion that if I retrace the steps I took at the beginning of this weight-loss journey, I might be able to do something different this time. So I’m back to tracking everything I eat or drink through the WeightWatchers website while following my usual blue-print. This has automatically reduced my portion sizes to where they should be and stopped the sugary treats. As these are the things I knew I had to address, the website is working for me rather than forcing me into something I don’t want. I’ll keep using it for as long as I find it useful. At the moment, I’m finding it very reassuring to keep within my Points and not have to think about whether X amount of pasta is too much or whether I really need to eat item Y. As you know, there are two other strands to my Healthy Laura Campaign: exercise, and caffeine. I’m a little further along the path of being willing to exercise. Yesterday, when I was walking to my destination I decided to see if I could run between lamp-posts. I can. And then I can walk for the next three lamp-posts and run between the next ones, etc. Unfortunately, my knees and hips protested quite quickly and I’m sore today but the fact that I was willing to try is a big step forward. Being in pain is obviously a sign that I’m still to heavy to run which is fine. I’ll try it again when I’m down to 12st something lbs and see how it feels. In the meantime, I’m nearly ready to say I’ll do some intentional exercise on the days I’m not in pain. Nearly. Almost. But not quite. The reality is that I’m lazy and busy with other things. So I’m going to accept that this is where I am and just continue walking instead of using the car (easy when its brakes are broken!) My mindset has changed over the past few months and, I think, if I continue accepting instead of nagging myself I will get into mindset of being willing to exercise. Caffeine is another area in which I’ve slipped. And I’ve slipped further into old habits with this than I have with food where, I think, I’ve stopped the rot fairly quickly. Sigh. I know what I have to do. I’m still on decaff for tea and coffee but am happily quaffing soft, sugar-free drinks. It’s hot. I’m thirsty. And, heck, I like them. At the moment I’d rather have a Coke than a coffee. I’m also really tired (perhaps because of the extra weight?) and ‘needing’ the kick of caffeine to get myself moving. But, with that kick comes anxiety later in the day. And it’s not really worth it. Sainsbury’s is going to deliver my groceries tomorrow night and I’m going to add some caffeine free Coke to the order as it’s not easily available locally. This means I’ll be extra-tired and very headachey for a week or so but should be worth it. I do hope so. I’ve made two big decisions recently. And I do mean ‘recently’ because although I’ve been heading towards these lifestyle changes for a few months, I’ve only become committed to them in the last 24 hours. I think it is perhaps true that an addict must ‘hit bottom’ before embracing recovery. Regular readers will know that I gave up caffeine for Lent and, liking the reduction in anxiety and migraines I experienced, decided to keep the change. But I wasn’t committed to it. Not really – I’d happily quaff a Diet Coke for a ‘treat’ or take painkillers bundled with a caffeine hit. Yesterday I made myself feel really ill and decided to cut out caffeine totally. Meantime, I’ve been successfully slimming by avoiding my trigger food (sugar) and, therefore, not bingeing. Until today. So what went wrong? And what’s going to be different in the future? 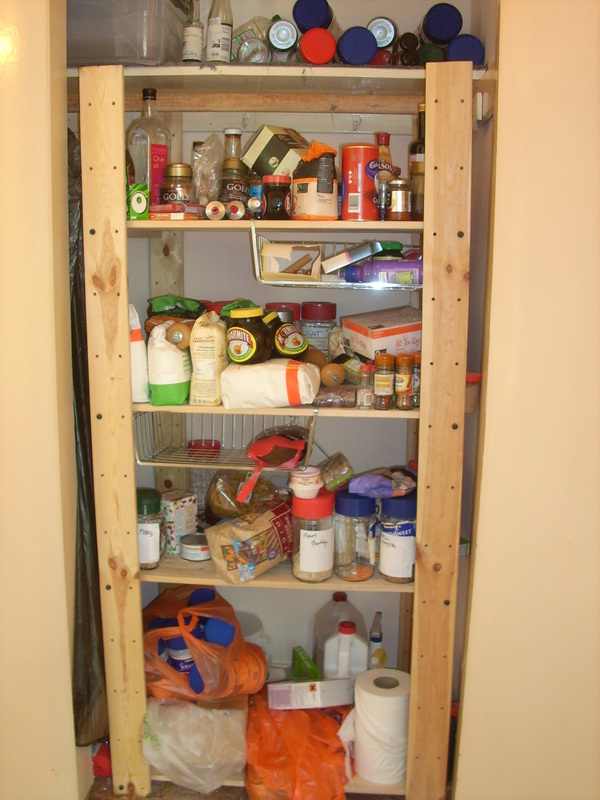 What went wrong is clearing out the larder. I’ve been meaning to do it for a while – as you can see from the ‘before’ photo it was a mess and I’d got the the stage where I’d no idea what was in there. So having decided the caffeine had to go for good, I decided to kill two birds with one stone and clear it out while purging the caffeine. And all went well until I found the sugar. My trigger food. The sugar. Had I forgotten it was there? Kind of, I suppose. It certainly hasn’t been preying on my mind. I’d kept it to bake (for charity events, not for me to eat) and it’s been lurking on the second shelf of the larder without causing me any problem at all. Until I had to handle it this morning. And see it. And smell it. And taste it. Sad to say, the rest is history and I’m feeling very sorry for myself as the hangover begins. And, of course, tomorrow I’ve to weigh-in with my Doctor when my body will still be bloated and unhappy and heavy. So I’m cross as well as headachey and nauseous. But onwards and upwards. What’s going to be different in the future? I’ve learned that the sight and smell of sugar is enough to trigger a binge. Previously, I thought I was OK to have it in the house and even cook with it so long as I didn’t taste it. This isn’t true – would you ask an alcoholic to work in a pub? So I’ve thrown all my sugar into the bin – even the icing sugar for which I haven’t yet found a non-sugar alternative – and I won’t be allowing it back into the house. What happened today is part of the learning process and I’ll try hard not to beat myself up about it. This will be easier when I’m feeling less physically ill, of course. It’s hard to feel ill and know it’s your own fault. 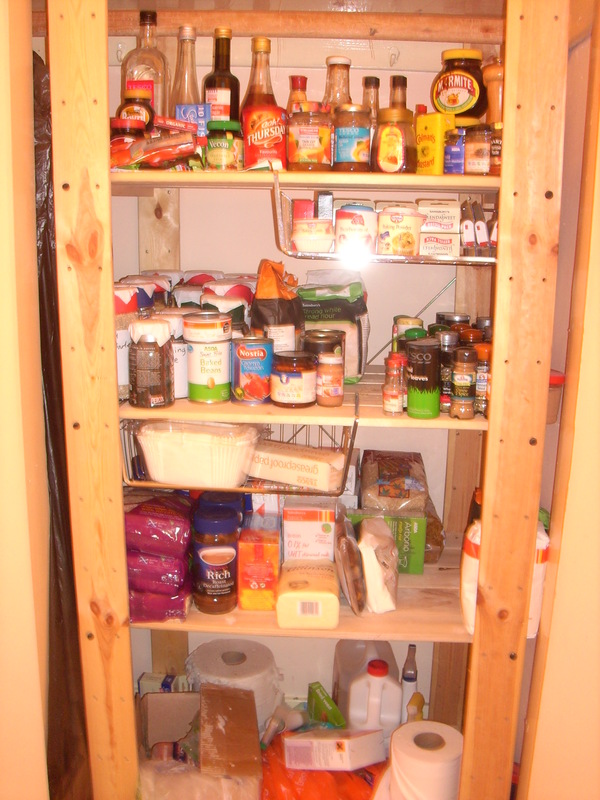 But I do now have a tidy, usable larder and a familiarity with its contents which was previously lacking.